Na Dara! — Don’t be scared! Some years ago I was at a party in New York. Several of us took turns at the piano. Some were amateurs, others professionals. When it was my turn, a guy came up and stood by the piano nodding appreciatively. He kept saying, “Great music man, great jazz.” He seemed to know that I was a Gypsy and asked me if I could play something Hungarian in the Gypsy style. I played him an instrumental piece by Laci Rácz. “Wow, this is fantastic” he said after I had finished. Then he asked me if I could turn that into jazz. It was a challenge, an intriguing thought that hasn’t left me. To begin with, I hadn’t a clue how to go about it. It’s not a question of just transposing the notes. Nor is it a matter of chords. After all, it was only a three-chord piece. Eventually it came to me. It was the freedom of the music. If you listen to this album you will hear the regular beat of jazz carried by the bass and the drums but the sort of time I play on the piano is free. I deliberately make the piano sound like a cimbalom (a folk instrument, rather like a hammer dulcimer used by the Gypsies of Hungary and Romania). Don’t think me conceited, but I do think this album is unique. In a way it’s a new style. Call it ‘Gypsy jazz’, if you like. No one disputes that jazz comes from America, but some Americans are reluctant to admit that there’s such a thing as European jazz. However, all American musicians, be they black or white, make one exception and that is the late great Belgian Gypsy guitar player, Django Reinhardt. When they first heard him over there they recognised his music as jazz, although not quite the same as their own. Django hardly ever played the blues, yet his music had the texture and feeling of jazz. My music is, inevitably, more modern than that of Django and it comes from a different Gypsy tradition. If you think about it, the traditional Hungarian Gypsy band with its violin, viola, double bass and cimbalom, performs the same type of simultaneous improvisation as the classical New Orleans jazz bands did at the turn of the last century. What is very special about the Gypsy bands is the uncanny time-keeping combined with the freedom of playing rubato. Any jazzman who has ever heard a Gypsy band is always amazed by it. But that is the combination you will find on this album too. It hasn’t been at all easy to make this happen. To create this sort of music, you need to find yourself, you need to explore your own identity and then you have to put your own stamp on it to make it sound unique. You also need to find the right partners. As for finding one’s identity, for 40 years under communist rule we lived in relative musical isolation. We were locked in a kind of time-warp. I was 9 years old when I took up the piano. I came from a very poor family. I wanted to be a concert pianist and a classical composer. My family simply wanted me to be a working musician who could make a living. At an early age I was taught how to accompany the lead violin in a traditional Gypsy band. But then classical music took precedence until in my teens, when I was already at the conservatory, I discovered jazz. It was ‘love at first sound’ and there was no turning back. I gradually dropped classical music and immersed myself in jazz. Under the old regime a certain sense of liberation was gained by playing like the great American masters. Later I became the first jazzman in this country to branch into fusion, thereby scandalising some of my peers. Quite a few eyebrows were raised again when they found out that I had been listening a lot to rock music as well. I also composed for the theatre and wrote some Gypsy musicals and rock operas too. Eventually I found my way back to classical music as well. I’ve returned to Bach and Mozart, to Stravinsky, Bartók and Schönberg and embraced the contemporary composers like our Péter Eötvös, György Ligeti and György Kurtág. And yet, even with the collapse of communism and the arrival of freedom, at first I was still reluctant to find my own identity or to reach back to the music of my ancestors. We were all afraid, I think, because we had never had that sort of freedom before. Also, one was afraid of ridicule. But the time has come to pluck up courage and to show one’s true colours. I believe that what we have on this album is world music in the truest sense of the word. To my mind, world music is not when a Cuban musician or a Gypsy plays the tunes of his own people but when various musical cultures and styles merge into one. Here you have the Hungarian and Gypsy elements fusing with the strains of Oriental music, occasionally straying into the blues while phrases crop up even from Bartók’s Piano Concerto No. 1, and there is the undeniable influence of twenty-first-century contemporary music. But all through this pulses the underlying current of jazz. Last but not least, there was the problem of finding the right partners. Among the Hungarian Gypsy jazz musicians of today there are very few who have the right background to recall the feeling of authentic Roma folk music, or even of the popular music played in cafés of old. I had to find some talented youngsters and teach them from scratch. It was extremely hard work because their time keeping had to be extremely tight against my rubato playing. To make things even worse, sometimes the drummer, sometimes the bass-player was asked to free himself and to play like me while the other was required to keep strict tempo in the jazz idiom. The bass-player, György Orbán, a young man in his twenties comes from a dynasty of Hungarian Gypsy musicians. If he puts his mind to it, he could easily play double bass in a tradi- tional Hungarian Gypsy band. He is very gifted, much in demand by other jazz players and he has absolutely the right feel for this music. The young drummer, András Peczek Lakatos, also enormously talented, the offspring of a well-known musical dynasty was not quite twenty when he was chosen as Young Musician of the Year on his instrument in a talent contest sponsored by Hungarian Radio. He is a perfectionist and practiced extremely hard in order to comply with everything I asked of him – and I asked for a lot. As for the vocals on some of the tracks, I was very lucky to find Mónika Rostás and her husband, Csaba Rostás. Their voices recall the authentic sound of Roma folk music, a lot of which I collected myself in the remote parts of Eastern Hungary and some of which served as the springboard for my own compositions. Béla Szakcsi Lakatos appeared in the fifties and sixties in guitarist Andor Kovács’ group, but by the mid-sixties he was performing with his own band. In 1970 he won second prize at the Montreux Jazz Festival with Aladár Pege’s quartet. From Zürich to Warsaw, from Nürnberg to Belgrade, from North America to Asia he has performed at the most prominent festivals. As the soloist of Special EFX created by George Jinda and Chieli Minucci, Szakcsi featured on eleven albums as composer and performer, and it was thanks to these that in the middle of the eighties he was able to make a contract with the American company GRP (Sachi, 1988; Mystic Dreams, 1989; Eve of Chance, 1992; Straight Ahead, 1994). 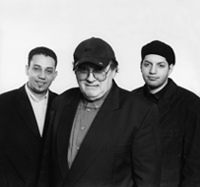 Szakcsi’s qualities as a composer and performer were appreciated by Chick Corea, and he has played with great figures in the genre, such as Carmen Jones, Frank Zappa, Art Farmer, Mark Ledford, Dave Weckl, Omar Hakim, Terri Lyne Carrington, Marvin “Smitty” Smith, Jay Leonhart, Gerald Veasley, Victor Bailey, Randy Roos, Attila Zoller, Rodney Holmes, David Sanchez, Bob Mintzer, John Patitucci and Jack DeJohnette. Historically, it is Szakcsi whom we must credit with the spread of fusion jazz in Hungary: from the beginning of the seventies, he taught jazz piano at the Béla Bartók Secondary School of Music. In the meanwhile he was also occupied with collecting Gypsy folklore and forming it into stage works. His first Gypsy musical, Red caravan was shown in 1975, and was followed by Once upon a time a gypsy girl and Cartwheel. In 1989 he wrote a rock opera entitled The beast about Erzsébet Báthory, and in the quincentenary of the discovery of America he presented a one-hundred-minute ballet at the Hungarian State Opera. Szakcsi is equally at home in all these musical genres. He recorded Hungarian folk song arrangements with the opera singer Ádám Horváth and the folk singer Gyöngyi Écsi (My flower, my flower, 1988), and pieces for four hands with the pianist György Vukán (Conversation for two pianos & orchestra, 1998; Das Duell I-II-III - Vukán-Szakcsi in Gottingen, 1998; Conversation plus, 1999; Fourhand, 2000); in the meantime more jazz recordings were made with Imre Koszegi and Jackie Orszaczky (Journey in time, 1998), Bob Mintzer and Peter Bernstein (On the way back home, 2001). Over the last ten years he has immersed himself in the study of the compositions of György Kurtág, György Ligeti, Péter Eötvös and Pierre Boulez, resulting in the album In one breath (BMC CD 061) made with the violinist Lajos Kathy Horváth, in which he pays a homage to these composers in his improvisations. The Hungarian State recognised his work by awarding him the Liszt Prize in 1987, and the Artist of Merit award in 2002. Thanks to Géza Csemer, the librettist for the musical Red caravan, and to Laci Rácz, for the theme that sounds in the composition 8th district. Special thanks to Nimród Kovács (President of UPC Central Europe Group), Péter Eötvös, Lívia Járóka, Vilmos Dési, Katalin Kállai, and Péter Pallai.